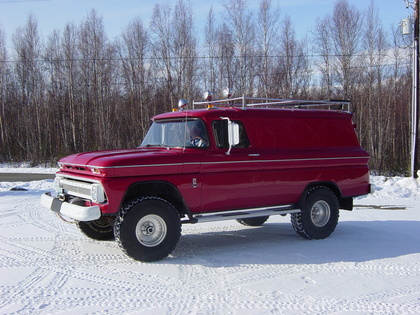 Roger, from Alaska, sent us this photo of his original 4wheel drive 1963 Chevy C10 Panel Truck complete with PTO driven winch! Under the hood is a 292 – 6 cylinder engine and 4 speed transmission. The interior was completely redone with insulated walls and the wood floor replaced. Front brakes were converted to disc for better stopping power along with a dual reservoir brake master cylinder.